Mantis Easy Spin ComposTumbler Review: Is It Right For You? More and more people are realizing the benefits of composting. It is an opportunity for them to recycle and be more sustainable in their practices. Furthermore, compost provides excellent, nutrient-rich soil for their garden, which can be used to feed plants and more. Because so many people now want to use it, there has been an influx of different composters on the market. The result of this is that can feel quite overwhelming to choose one. Here, we will take a look at the Mantis Easy Spin ComposTumbler, what it offers, and whether it is right for you. The ComposTumbler comes with a fully enclosed design. This means odors are eliminated, and pest and pets aren’t attracted to it. It is fitted with a large removal door, making it very easy to fill and empty it. The air vent placed on the top ensures oxygen can flow continuously, and excess moisture is easily drained through the drainage vents. It is a very affordable device that enables people with container gardens and other small spaces to recycle. The drum is heavy duty, food-grade polyethylene, BPA free. It has interior fins to mix the compost, producing loamy, rich compost in just four to six weeks. Mantis provides a two year warranty on all parts of the ComposTumbler. It is fitted with turning grooves, to make it easy to turn the drum. The design ensures that air can ventilate easily, while excess moisture is automatically released, without losing any compost. Thanks to the polyethylene drum, the temperature stays constant inside, regardless of outside temperatures. This means it can be used all year long. Mantis is a well-known brand in the world of composters. The company is known for efficiency and ease of use, thanks to the unique tumbler design. The drum is fully proportional, so that composting time is significantly reduced. The company also provides a lot of advice on how to create proper compost, explaining that it is all down to allowing the core heat of organic materials to build up as quickly as possible. The ComposTumbler’s dimensions have been accurately calculated by professionals so that it can build up the maximum core heat as quickly as possible. Then, when the drum turns, the materials mix up, while stabilizing the core. 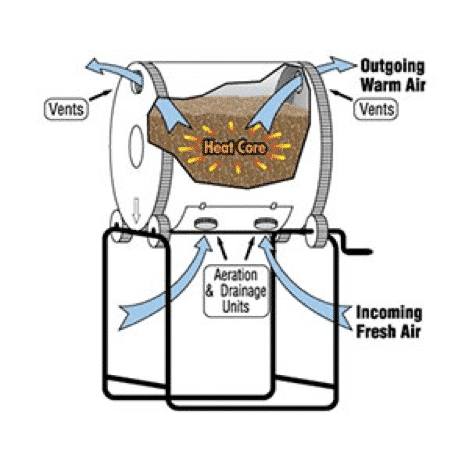 The key to proper composting is air and moisture. This is why the ComposTumbler has vents on the top and on the sides. By allowing good ventilation while draining moisture at the same time, the resulting compost is perfectly balanced, creating a nutrient-rich product. All that the users have to do is toss in their kitchen and garden throw-outs. They should then rotate the bin, repeating this several times per day. Thanks to the turning grooves built into the device, this is very easy to do. The Mantis Easy Spin ComposTumbler is quite small, having been designed for container gardens. 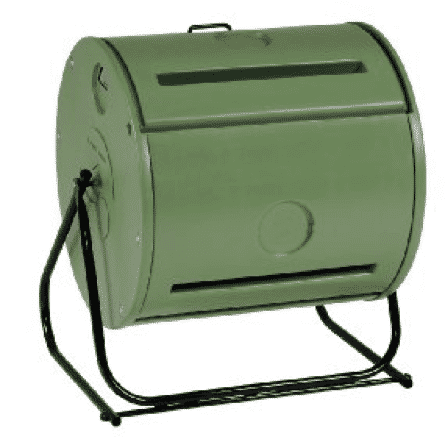 Because it is smaller than most other composters, it is also a lot more affordable. The company designed it with urban, small spaces in mind, ensuring that even people with the smallest garden can recycle their organic wastes. Designed to be user friendly, it is very easy to load and unload. It is a Mantis product, which is known for fantastic designs. The vents for air circulation and moisture removal are key to ensuring quality compost is produced. As a smaller composter, it is clean and neat. It is also fully enclosed, which means no odors are released, thus preventing wildlife, pets, and rodents from being attracted to it. The composter is made from high quality and durable materials, and is therefore designed to last for years. It comes with a two year warranty on all parts. It can be used in any season thanks to the polyethylene interior. It is designed for container gardens, meaning it perfect for urban areas. While user friendly, the drum can get very heavy when filled. This makes it more difficult to turn the drum. It is designed for smaller gardens only. This means it can get filled quite quickly. For some, the composting has not yet been completed by the time the drum is completely full, leaving them with excess organic waste. Is The Mantis Easy Spin Right For Me? Small gardens like container gardens. So is the ComposTumbler the one to get? The device has some clear pros and cons, and only you can decide which ones will be of greatest importance to you. If you have a small garden, and you are reasonably physically fit, then this may just be the one for you. However, if you are frail or if you have a large family and produce a lot of organic waste, then you may want to consider something else. In terms of performance, however, there are no complaints about the Mantis Easy Spin ComposTumbler. It works very rapidly and both the ventilation and moisture drainage systems are second to none. While there have been some complaints about the device being difficult to set up, none have been received to say that the composting itself doesn’t work. 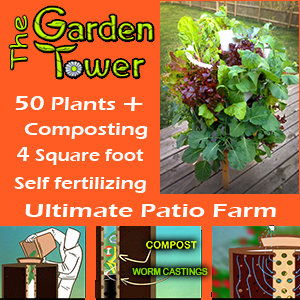 Very few composters are able to complete the process as rapidly as this one. In fact, there is only one on the market that is quicker, which is made by the same company. That is an even smaller device that can finish the process in just two weeks. If you want to create beautiful, healthy compost, without having to perform complex actions such as stirring the mixture, adding worms, or any other such things, then the Mantis Easy Spin ComposTumbler is the device for you. Check Out The Mantis EasySpin NOW!